There are many reasons. We may have many movies or have downloaded some cool videos from the web which are in the format of AVI. And we like some part in these videos very much and want to capture the part from the video so as to create our remarkable forum avatar. Or we tend to embed some AVI files to the web page. But it’s difficult to display AVI files on the website as we need some extra coding or additional plug-ins. So a much easier way is to create animated GIF from AVI. First we need a professional AVI to GIF tool. I confess there are some related online tools, but all of them can just convert a whole AVI file to GIF and the output quality is so low. Actually, we can search the target words on Google or Yahoo to find some useful programs. And this time, I’d like to share you the best Video to GIF Converter I’ve ever used. 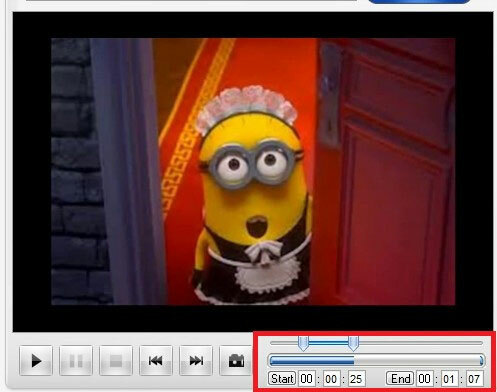 The Video to GIF Converter is an easy-to-use little tool. It can help us convert almost all video formats like AVI, MPEG, MP4, WMV, MKV, MOV, VOB, etc to GIF or any other commonly used image formats including JPG, BMP, TGA, PNG, TIF, etc. 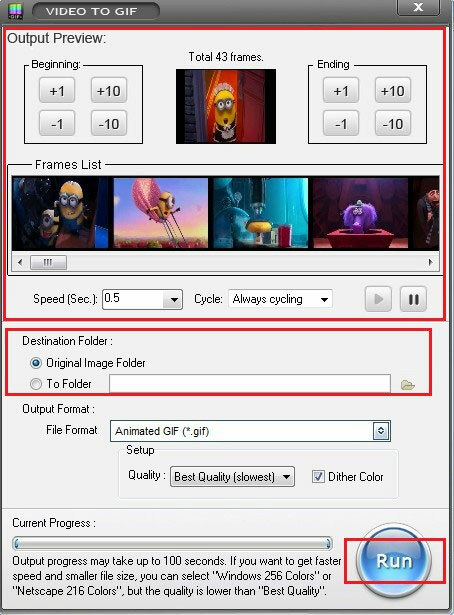 The following guide includes 3 simple steps to create animated GIF from an AVI file, for example. 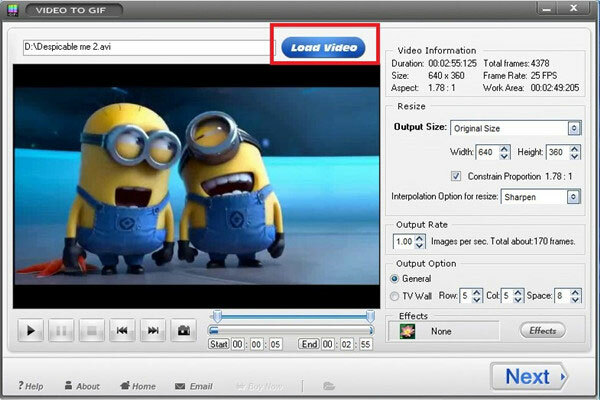 Before the AVI to Animated GIF conversion, make sure you’ve downloaded Video to GIF and installed it on your PC. Open the AVI to GIF tool and click “Load Video” to input an AVI video. Set the length of the part that you want to convert into GIF by dragging the time-line bar under the preview window. Or you could just fine tune each frame by typing a number. Click “Next” and another window will pop up. Here you can preview the output animated GIF. Choose an output folder and then hit “Run”. The AVI to GIF task will be finished soon. Just enjoy your GIFs freely.